When Imogen returns to work at Glossy after six months away, she can barely recognize her own magazine. Eve, fresh out of Harvard Business School, has fired "the gray hairs," put the managing editor in a supply closet, stopped using the landlines, and hired a bevy of manicured and questionably attired underlings who text and tweet their way through meetings. Imogen, darling of the fashion world, may have Alexander Wang and Diane von Furstenberg on speed dial, but she can't tell Facebook from Foursquare and once got her iPhone stuck in Japanese for two days. Under Eve's reign, Glossy is rapidly becoming a digital sweatshop—hackathons rage all night, girls who sleep get fired, and "fun" means mandatory, company-wide coordinated dances to Beyoncé. Wildly out of her depth, Imogen faces a choice—pack up her Smythson notebooks and quit, or channel her inner geek and take on Eve to save both the magazine and her career. 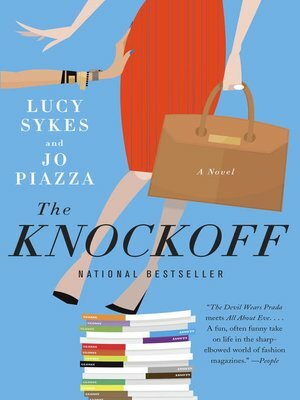 A glittering, uproarious, sharply drawn story filled with thinly veiled fashion personalities, The Knockoff is an insider's look at the ever-changing world of fashion and a fabulous romp for our Internet-addicted age.